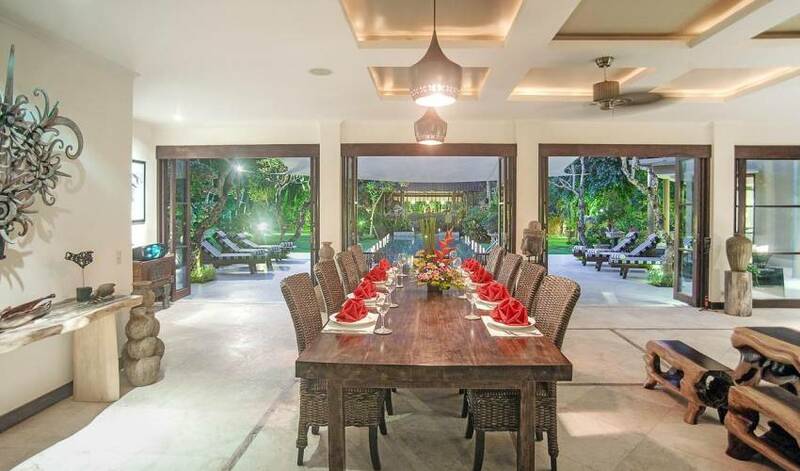 The villa is a glorious garden estate barely 60 metres from Kayu Putih beach in Batubelig just north of Seminyak on Bali’s south-western coast. 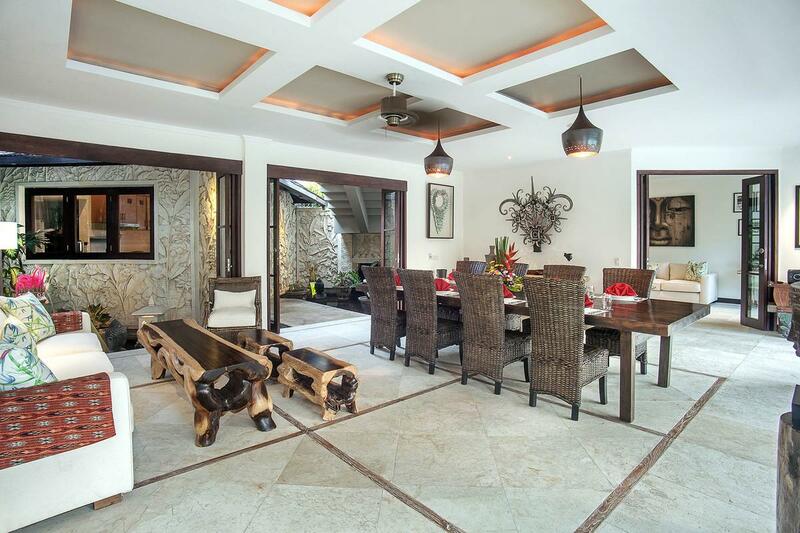 Designed by internationally famed architect Popo Danes and served by a staff of ten, the 1/2-acre estate comprises the iconic four-bedroom, the two-bedroom, and the one-bedroom – each with their own pool and private garden. 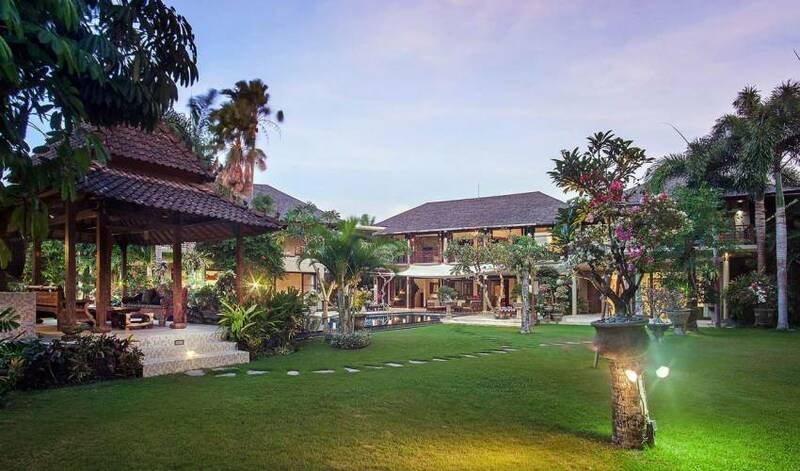 All three can be rented separately or together in multiple configurations, making this villa perfect for everyone from a romantic couple to a few families holidaying together or a group of up to 21 friends. 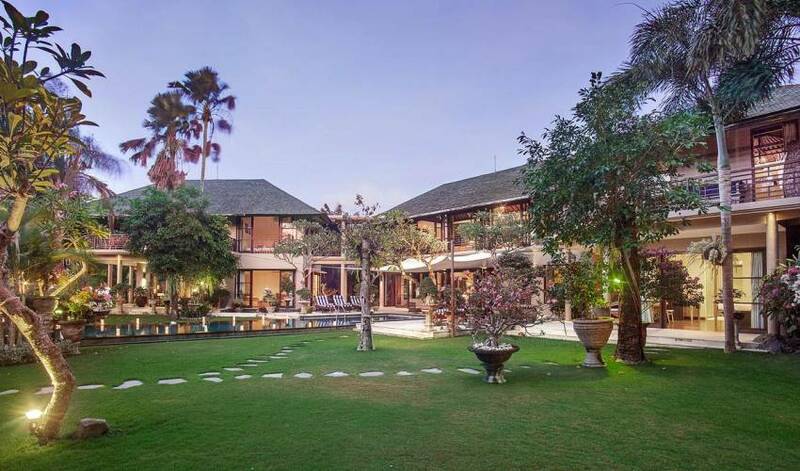 Welcome to this villa – a glorious seven-bedroom sanctuary a stone’s throw from Kayu Putih beach just north of Seminyak. 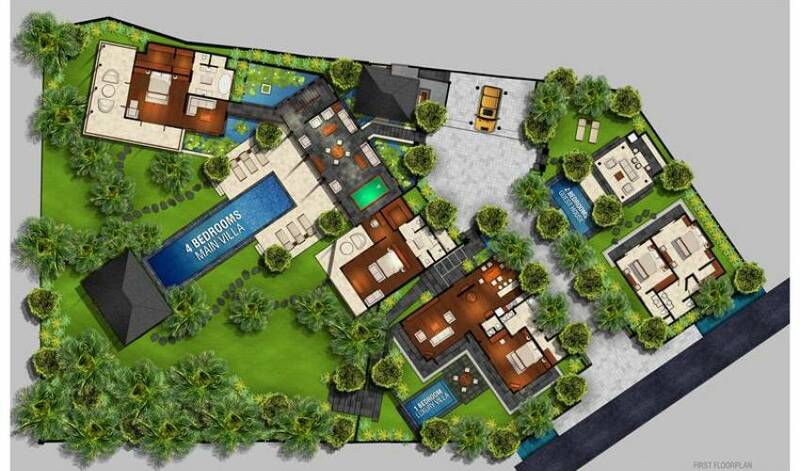 Three individual villas make up this villa – the iconic four-bedroom main villa, two-bedroom, and one-bedroom – each set in beautifully landscaped gardens complete with private pool. Book just one villa or all three; the flexibility of bedroom configurations gives you the choice of anything from one to seven bedrooms. 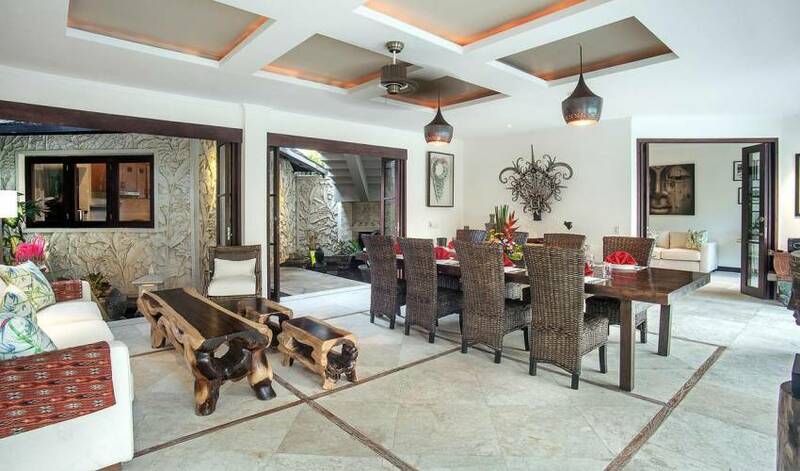 Award-winning Balinese architect Popo Danes curated the design, crafting contemporary interiors with an Asian twist using Indonesia’s abundant natural materials – elaborately carved sandstone walls, polished teakwood floors, paras stone sun decks, marble basins and terrazzo baths. 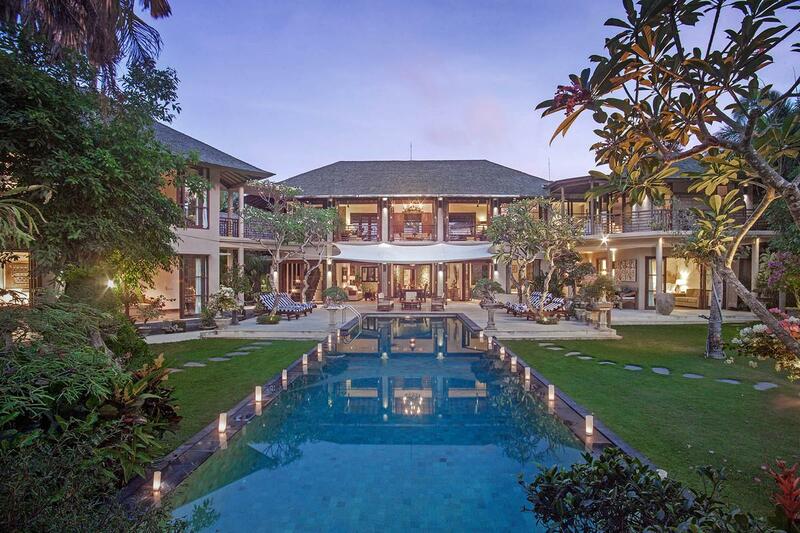 Vast living areas and individual bedroom suites are embellished with rare antique furniture, modern ‘classic’ pieces and handsome Balinese paintings and artefacts. Coffee table books on Asian design and a library of interesting fiction feed the mind, while within the extensive gardens, heritage teakwood joglos, koi-filled lotus ponds with riverstone water features, moss-covered statuary and the abundance of tropical blooms and manicured bonsais feed the soul. 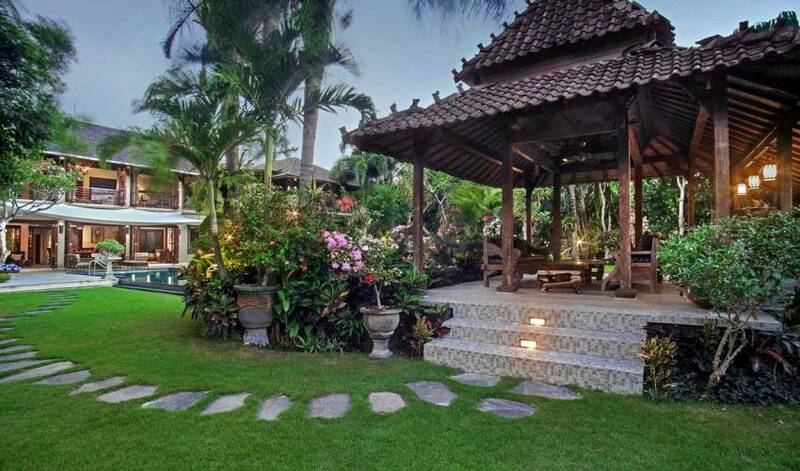 Accompanying the birdsong is the sound of surf crashing onto the beach just beyond the sacred shrine that lies the other side of the villa’s boundary wall. Feeding the body is the task of the resident chef, who happily whips up Indonesian and international meals from a suggestion menu. He is one of 10 “nothing-is-too-much-trouble” staff dedicated to making guests feel super-special. 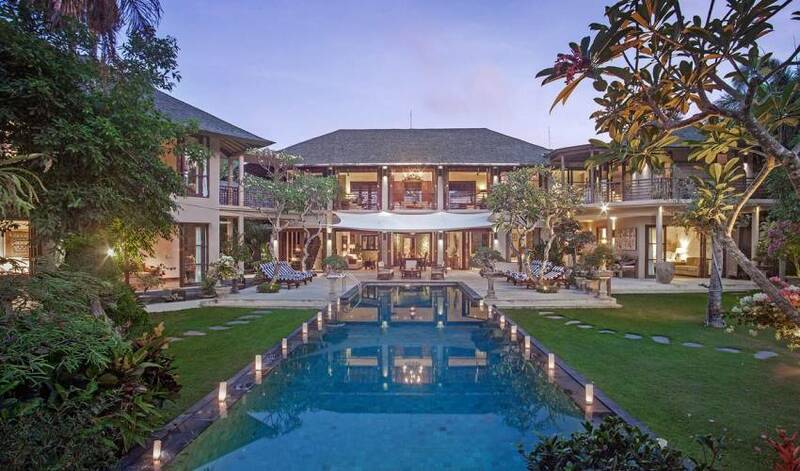 When guests have had enough of the three pools, the pool table, and all the privacy and luxury accords, they can venture onto the expanse of Kayu Putih beach just beyond the villa’s entrance and, facing it, one of Bali’s hippest beach cafes La Laguna – perfect for sunset cocktails and tapas. 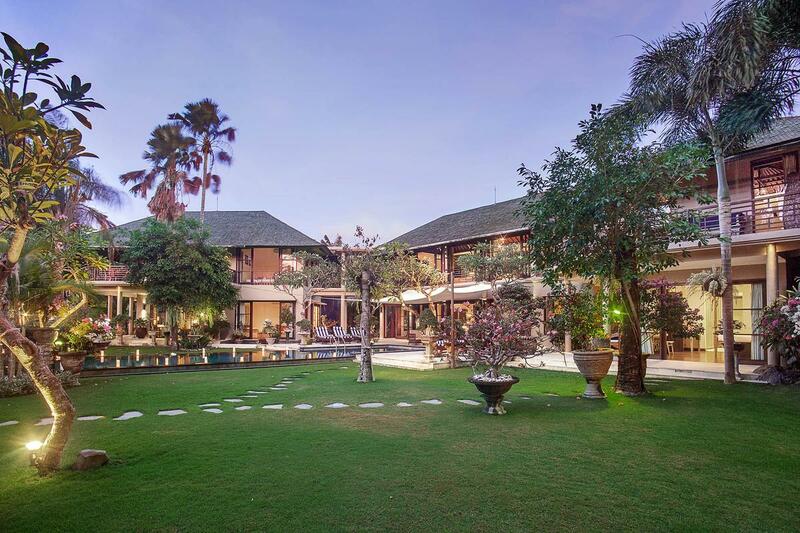 Five minutes’ stroll down the beach is Mozaic Beach Club; W Hotel, Potato Head and other notable Seminyak establishments are just 10 minutes further (even less by taxi). 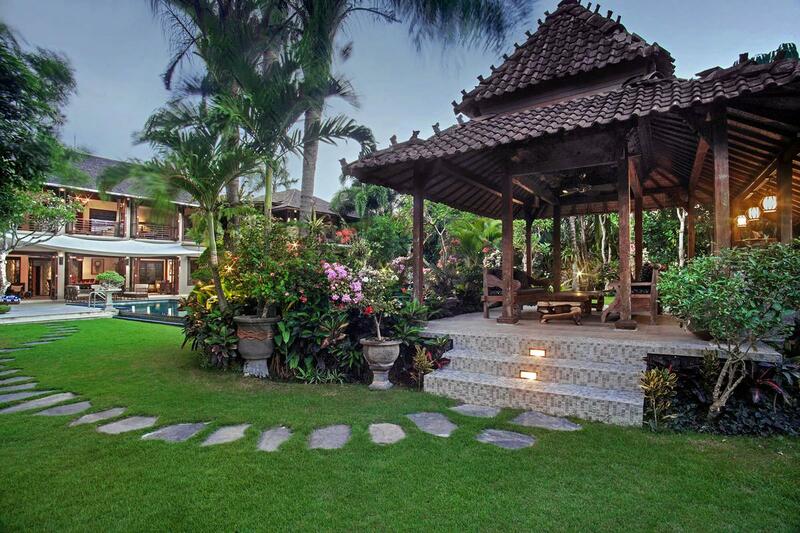 Villa Avalon is the very last private residence on a small lane leading to Kayu Putih beach; just a small temple shrine stands between the villa and a small lagoon, over which a walkway of reclaimed timber leads to the kilometres of sandy beach. 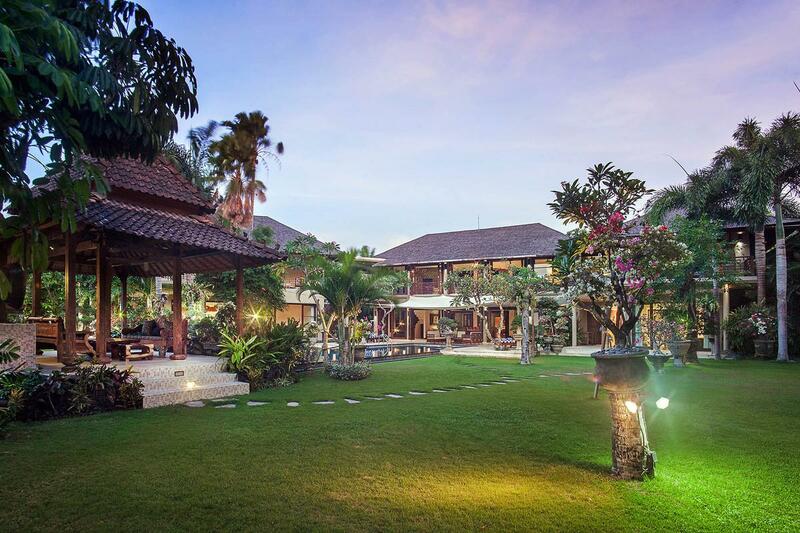 La Laguna, a popular restaurant and sunset bar, is a hop and skip away, Mozaic Beach Club a five-minute stroll along the sand; even W Hotel, Potato Head and the famed bars and restaurants of Seminyak are only a 15-minute walk from the villa. A five-minute stroll inland brings you to an expat-focused supermarket and gelato stop. 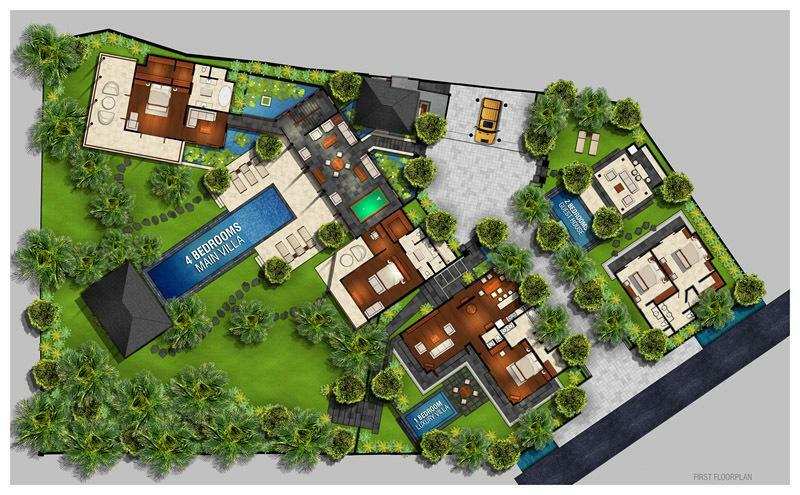 This is an amazing location, right on Seminyak’s doorstep yet with the peace and quiet of a far more rural setting.